This is a Galapagos tortoise (Testudo vicina). This specimen is the remains of one that died in the Bronx Zoo in the 1920's, and we no longer know how old it was when it died, which of the islands it came from, or how much it weighed when it was alive. Gigantic land tortoises seem to readily evolve on islands; there are different species from the Seychelles, Mauritius, Albemarle Island, as well as the Galapagos. If the plant-eating tortoises can reach an island, either by a raft of floating vegetation or some other means, they will do quite well. They are cold-blooded, so with their low metabolism, they can wait out periods with little food or water. They will also tend to evolve into giants, both as defense from predators and by sexual selection for reproduction of both the male and the female. The larger males will be more successful in competition for mates, and the larger female will lay more eggs. As I said, I do not know what the weight of this specimen was when it was alive. The carapace though is about 36 inches long. The largest individual tortoise I have been able to track down, was an animal that lived in the London Zoo in the 19th century. 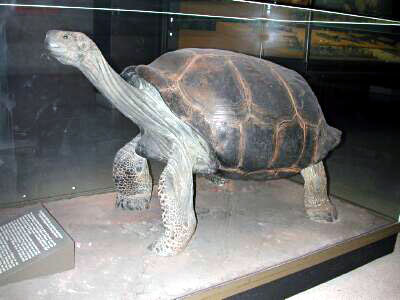 It was from Aldabra, one of the Seychelles, and weighed 575 lbs. and its carapace was 55 inches long. Using this as a guide, we now come to Testudo aubreii, as first seen in HMS Surprise, where Dr. Maturin described it as weighing a ton, and also discussed in The Reverse of the Medal. Here, I think, we have a tall tale from Mr. O'Brian. 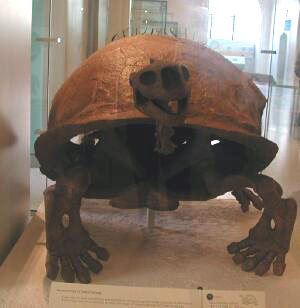 The largest fossil land tortoise specimen found also has a body of about 55 inches long. If a tortoise would weigh a ton, 2240 lbs. (English measure), it would have to be about 1.5 to 2 times as long (depending on whether the weight is a cube law or square law relationship), or 83 to 110 inches. This is much larger than any specimen (live or fossil) ever reported. As support for my idea that Mr. O'Brian is practicing on us, I would like to point out that Testudo aubreii is found on an island that has no name and no fixed position on any chart. The discoverer is an individual who has just performed open heart surgery on himself, removing a bullet from his own chest. All the wonders of natural history observed by Doctor Maturin and Captain Aubrey weren't living creatures. Let's look at some unusual rocks.